When you have perfect attendance and we hit our attendance targets we're able to donate money to causes that are important to you, using our Motorvate cheques. Kevin Dickinson, along with some of his colleagues from Halewood play for Hale Football Club, an amateur adult football team. In recent years they’ve struggled for funding and they’re in desperate need of some new kit. 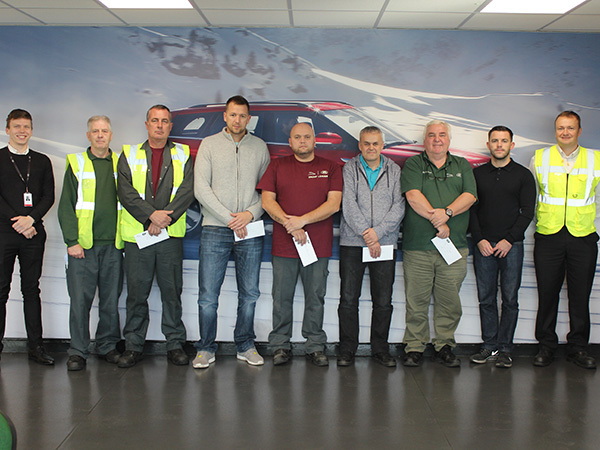 The Motorvate cheque will help them to buy what they need – we look forward to seeing their team photo very soon! Barry Middleton has requested a donation for Halton Riverside Boxing Club. The boxing club is in the same building as the Gym that Barry uses and only opened 12 months ago. The Gym offers many services for all ages, including; Coaching and training, Weight loss, fitness camps and kids clubs. Since opening Barry has noticed a big difference in the local community and to the individuals that enjoy the club. The Motorvate cheque will help with much needed new equipment which will help the club improve their classes and facilities. Ryan Ward is currently the Team Coach/Manager for his sons under seven's team at Winstanley Warriors JFC. The club formed in 2004 with the aim to let young children play football in a safe environment. The Motorvate cheque is going to help the club buy some much needed training equipment and kit. Andrew Shurie shared with us details about his sons swimming club, Halton Swimming Club. The club is a competitive swimming club which competes in Swim Gala’s up and down the country. The club is also active in the local community helping to arrange and run Halton Schools Swimming Gala’s. The club is only small, but that doesn’t stop them, as Andrew tells us, "They punch above their weight”. This season alone they have already one ten regional swimmers, five national swimmers and seventeen county level swimmers. That’s a massive achievement, well done Halton Swimming Club! Kevin Loughran is a busy man, as he volunteers helping his four grandchildren’s football teams, Heath Rangers Junior Football Club. The club is a non-profit voluntary club in Runcorn. They have 13 football teams, ranging from under seven’s to under 15’s and they also run a successful training academy for four to six year olds. The children all play football in leagues within Runcorn, Halewood, Bellevale and St Helens. There are many volunteers who help the club who all do if for the children and the love of the game. The club are going to spend their Motorvate money on a much needed defibrillator to keep at their home pitch Runcorn Boys Club. There are 170 children linked to the club and this important peace of equipment, which will be kept by the pitch match day could save lives. It will give piece of mind to everyone involved, including, players, coaches, managers and parents.